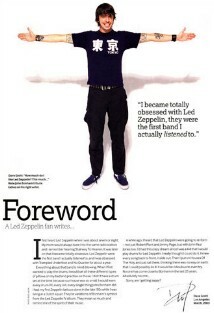 I first heard Led Zeppelin when I was about seven or eight. My mom would always tune into the same radio station and I remember hearing Stairway To Heaven. It was later on when I became totally obsessive. Led Zeppelin were the first band I actually listened to, and I was obsessed with Trampled Underfoot and No Quarter for about a year. Everything about that band is mindblowing. When I first wanted to play the drums I would just set all these different types of pillows on my bed and practise on those. I didn't have a drum set at the time because our house was so small. I would learn every drum-fill, every roll, every single thing John Bonham did. I had my first Zeppelin tattoos done in the late '80s when I was living in a Dutch squat. They're variations of Bonham's symbol from the Led Zeppelin IV album. They mean so much and remind me of the spirit of their music. A while ago I heard that Led Zeppelin were going to re-form - not just Robert Plant and Jimmy Page, but with John Paul Jones too. I'd had this crazy dream since I was a kid that I would play drums for Led Zeppelin, I really thought I could do it. I know every song back to front, inside out. Then I put on Houses Of The Holy and just sat there, thinking there was no way on earth that I could possibly do it. It would be ridiculous to even try. No one has come close to Bonham in the last 25 years. Sorry am I getting sappy?